Hi there everyone. It's me with my post for Bellarific Friday. This week, we had a sketch to work with and overall, I kept it the same except for skewing the image panel. Oops... Okay I'll admit it, I liked it better with the panel on an angle. 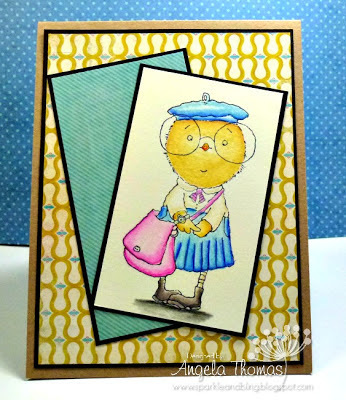 I received the new release from Stamping Bella in the mail last week so I decided I needed to ink up Mimi the Chick. I've inked her up with Archival black ink and then colored it with Prismacolor Pencils and Gamsol. Next week's theme is Button UP! Add buttons to your card. Remember to email your card to Em by Thursday to be included on Bloggabella and you could win some bella bucks! It's a bird, it's a plane, it's a super pig? ?